You know what’s great about the spring? It’s the bounty of fresh produce that makes its way to our kitchen tables. One signal that the seasons are changing is the sight of busy markets and roadside stands, at which you can find the caviar of vegetables: the artichoke. With a nutty and earthy flavor, artichokes are versatile and easily adapted into a multitude of dishes. While they are available to us all year long in California, the cream of the crop peaks from March through May, so dive into these recipes while the season lasts! Preheat oven to 400 degrees. Remove chicken thighs and pat dry. Season the chicken with sea salt, rosemary, oregano and garlic powder. Chop the garlic and shallot and set aside. Add the olive oil to a cast iron skillet over medium-high heat. Add the chicken skin side down and cook until golden brown for 6 to 8 minutes. Remove from heat and add the garlic, shallots, artichokes and capers to the pan. Place the cast iron skillet into the oven and cook for 20 minutes or until temperature reaches 165 degrees. Fill a large bowl with water and add lemon juice. Cut off the stem and the top quarter of each artichoke. Bend back the dark green outer leaves and snap them off at the base until only pale green leaves are left. Cut the artichoke lengthwise into 6 wedges. Place artichokes in lemon water and repeat with each artichoke. Steam artichokes until tender for about 30 minutes. Cool and remove choke and any purple tipped leaves. Turn barbeque on to medium high heat. 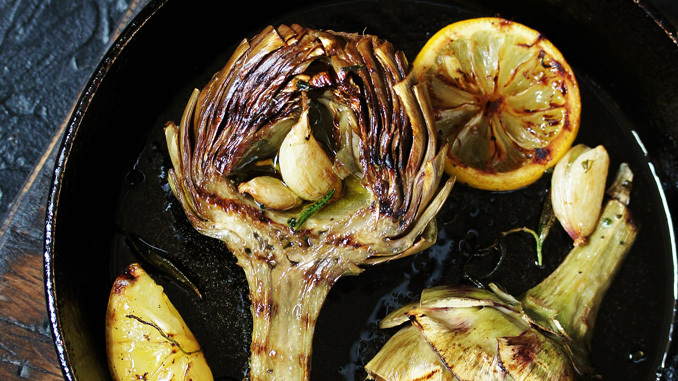 Stir olive oil and garlic in a small bowl and brush onto artichokes. Add salt and pepper and grill until slightly charred, approximately 8 minutes. Transfer to a platter and serve with dipping sauce. Preheat the oven to 375 degrees and lightly brush a 9-inch baking dish with olive oil. Add one tablespoon of olive oil in a medium skillet over medium heat and add onions for 5 to 7 minutes, or until golden in color. Stir in the garlic for one minute and remove from heat. Meanwhile combine artichoke hearts and spinach in a food processor until finely chopped. Add the yogurt, cream cheese, mozzarella cheese, half of the parmesan cheese, mayonnaise, salt, pepper and cooled onion mixture. Pulse until all the ingredients are incorporated. Transfer mixture to the baking dish and sprinkle remaining parmesan cheese on top. Bake for 20 to 25 minutes or until bubbly and hot. Serve with a rustic baguette, pita chips, or fresh veggies.